Sister Daniel Marie McCarthy, O.S.F. 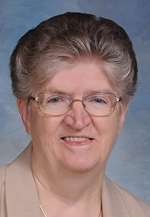 Sister Daniel Marie McCarthy, O.S.F., died Nov. 23 in Assisi House, Aston. She was 75 and had been a professed member of the Sisters of St. Francis of Philadelphia for 52 years. Sister Daniel Marie (Hanna Veronica McCarthy) was born in Bally Catten, County Cork, Ireland. She entered the congregation in 1962 and professed her first vows in 1965. Sister Daniel earned a B.A. in history. She ministered primarily in elementary education. She served for 47 years in the Diocese of Trenton including as a teacher at Holy Angels School and St. Anthony School, both in Trenton; St. Mary of the Lakes School in Medford; Corpus Christi School in Willingboro; St. John School in Allentown; and St. Rose of Lima School in Freehold. Additional ministry experience included teaching at Blessed Sacrament School in Walpole, Massachusetts, and volunteering at St. Paul Episcopal Church in Columbia, Pa. This year Sister Daniel Marie moved to Assisi House, the congregation’s retirement residence in Aston, where she served in prayer ministry and hospitality until her death. The funeral Mass was Nov. 29 at Assisi House, and burial followed in Our Lady of Angels Cemetery in Aston. Sister Daniel Marie is survived by her sisters Kathleen Petrie and Peggy O’Sullivan; by her nieces and nephews, and by her Franciscan family.